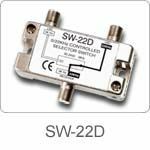 The SW - 22T, SW - 22D is RF selection switch which use in satellite receiving system. It can accept two signal from LNB of satellite dish then selecting the other one to pass via 22KHz of satellite receiver. The signal of satellite dish 1 is passed to satellite dish 2 is OFF, on normal conduction (22KHz OFF). When the satellite receiver send out a 22KHz (squire wave) , the signal of satellite dish 2 is passed and the signal of satellite dish 1 is OFF. • Wide Band, High Isolation(SW - 22D). • May Combine With 14 / 18V Sat - SW.
• As Multiswitch To Use.